If you’re interested in food styling and food photography, you’ll need to know how to create the sets on which to shoot the food images. The sets are essentially little worlds, consisting of backgrounds, linens, utensils, and dishes that you pull together in order to show off the food you’re photographing. If you’re shooting something elegant, you may want to go with a refined look for your set. Replicate something you may see in an upscale restaurant in a large city. When creating a casual set, you can build a replica of a warm and inviting country kitchen. This type of set is cozy, fairly rustic and suits comfort foods very well. Think pie — lots of pie. 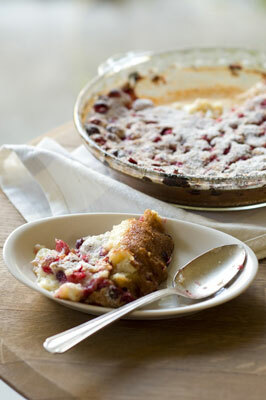 The clafoutis shown in the following figure is a delicious French comfort food. This shot uses simple dishes, a faded and mussed up linen, and worn silverware with bits of the food on it, all set on a rustic wood table. Backdrops, plates, utensils, and food accents are just a few ingredients for an appetizing set. The prim and proper type of setting is really quite elegant, clean, and upscale. This look may include some starched napkins and a white or black tablecloth. 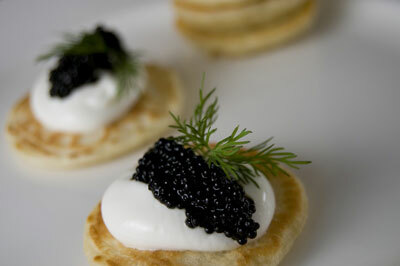 The caviar on blini shown in the following figure uses this type of setting. A clean white plate set on a white tablecloth allows the exquisite appetizer to shine. An elegant dish fits perfectly in the prim and proper setting. This look can possibly call for a sweep background, or maybe it can use the table itself. If using the table at a restaurant, some options include showing the immediate environment, like including some other tables in the background. Or perhaps you prefer a solid background behind the table. To create a solid color background behind a table, use duct tape to secure a large section of foam core at the back of the table. The foam core is so amazingly light, the tape should hold it in place very well. Another part of this look is using quality silverware or utensils. Adding stemware with wine may also be a logical addition. Overall, the look of this set should be one of very high quality. A red wine, such as cabernet or merlot, often photographs as a very dark brown and shows up too dark to see any of the lovely red color. When shooting red wine, cut the wine with a little water (up to 40 percent or so) until you can see a lighter looking red in the glass. The elements of the casual and cozy look are quite simple: a nice quality of light, an imperfect look that’s sometimes just a little messy, and maybe even a cool prop, such as a cake stand like the one in the following figure or an antique wood slat with some worn paint. This look represents warmth and home. 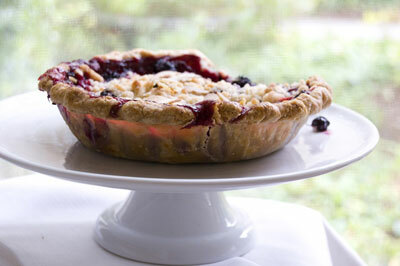 A berry pie near the window just oozes warmth and comfort. To create this style, start with selecting your background. A more natural background is best, so use something like a worn wood table or a cutting board. Add some white or colored plates, bowls, or other props that suit your subject and color scheme. Linens, a tablecloth, or cloth napkins in subdued colors complement the look. And perhaps some rustic utensils can complete the setting. A set that focuses on design, treating food as art, is an interesting alternative look for a shoot. When shooting with this intent, if your subject is already very arty, you can pare down the set to simply a white-on-white scheme as shown in the following figure. You can also opt to go industrial. Cool patterned metals can be used to suit a graphic-looking food subject. To design that type of set, place a patterned metal on a sweep or table. Be aware that a distressed, tarnished surface will reduce excessive shine in the metals. Slate is another good background for this look. Add some graphic linens and sleek modern dishes and voilà — you have the basis of an uber-arty set for a food shoot.